1. Preheat the oven to 220C, gas mark 7. Line a 900g non-stick loaf tin with the bacon, making sure the rashers are close together but not overlapping. 2. Mix the remaining meatloaf ingredients together thoroughly in a large bowl, then transfer to the prepared loaf tin. Finish by tucking the ends of the bacon over the top of the loaf. Roast for 20 minutes, until partly cooked. Mix the glaze ingredients together. 3. Remove from the oven and turn out onto a baking sheet. Brush with the glaze, then place back into the oven for a further 25 minutes. Serve warm, cut into thick slices. Delicious with corn on the cob and a green salad. 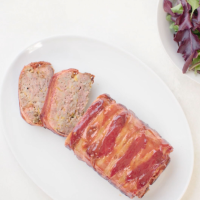 Wrap any leftover meatloaf, whole or in slices, and pop them in the freezer to use another time. Defrost fully and reheat thoroughly before eating. This recipe was first published in Thu Aug 17 14:07:01 BST 2017.